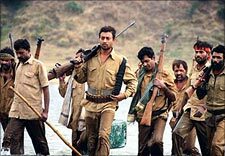 Towards the middle of Tigmanshu Dhulia's new film Paan Singh Tomar (PST), Irrfan Khan, who plays the title character, stands in a corridor of an army barrack. He has just talked on the phone to his mentor, a major in the army, when a young orderly places a packet of ice cream in Tomar's hand (it will make sense upon viewing the film). Khan's Tomar is deeply moved. With the camera on his partially-lit and weathered face, he gives a wide smile, one hand wiping the tears flowing down his cheeks. It is a beautiful, moving moment in the film. But the simple scene holds together because of Khan's performance, one of the best in his long career and comparable with his heartbreaking roles in The Namesake and the HBO series In Treatment. Khan is a national treasure, a unique gifted Indian actor who uses his eyes, voice and other facial features to display the humor and then pathos in his characters. There are many such remarkable scenes in Dhulia's film -- a compelling biopic about a natural sportsman and an Indian steeplechase champion from a village in Madhya Pradesh, who upon retiring became a notorious dacoit (or a rebel as Tomar reminds us towards the beginning of the film. 'Dacoits are found in the parliament,' he says with a nearly straight face). And Khan is mesmerizing in the film -- an innocent, naïve, charming athlete, a man with a clean heart, who later becomes an angry, menacing outlaw. The camera loves him and it is impossible to look away from the screen when the focus is on him. The film's publicity machine suggest that he trained for many months getting into shape (his lean body is perfectly designed for a role like this) and surely it must have been a challenge for an actor who is in his late 40s. The film spans most of Tomar's adult life -- from the late teens to the mid-50s, and Khan does it with great finesse. PST made rounds of a few international film festivals in 2010, including a South Asian event in New York City. But for some inexplicable reason this engaging and important independent film was held up for theatrical release. One report said the film was re-edited, although according to Dhulia he only re-did the background score, making it less invasive. PST has two distinct stories, just like Tomar's personal life. The first half of the film has Tomar shining as an athlete for the Bengal Engineers regiment in Roorkee with many remarkable, convincing and well edited athletic scenes -- a rarity in Indian cinema (with the exception of Chak De! India). In the second half, Tomar's post-army life is a messy tragedy for the man is drawn into a family argument over a plot of land. He had placed so much faith in the Indian army and the police force, but when all else fails he takes up arms to protect himself, his family, honor and more. Under Dhulia's direction, the transition of Paan Singh Tomar, the gentle athlete who carries a picture and memory of a Japanese female fan, and flirts with his wife (Mahie Gill) in the sweetest manner, to the feared rebel, seems justifiable. As the audience, we stand by Tomar despite some heinous crimes committed by him and his gang, just as in Kapur's film we supported Phoolan Devi's mad rampage against those who had wronged her. Dhulia statement is clear -- in an unjust society, some crimes become a necessity! The settings, the language, the costumes, the supporting cast all appear authentic. Dhulia takes us on a journey inside a world that few of us know. My own knowledge of the Chambal ravines is by looking out of fast moving trains on journeys from Delhi to Gwalior, Madhya Pradesh. Seeing PST, we come out of the theater learning so much about the real India that exists far away from the unreal world of contrived plots, garish costumes, item numbers and other nonsense most of Bollywood films feed us week after week. Dhulia has one more agenda in making PST. He reminds us -- as the statement at the end of the film makes it amply clear -- that India has a sad track record when it comes to the treatment of its former athletes and who were real national heroes. That statement carries a lot of significance in current times when some sports in India, especially cricket, have become a big business. Millions of dollars are spent buying, promoting Indian Premier League players and teams. Players like Sachin Tendulkar, an Indian hero alright, are certainly well taken care of through all his endorsement deals. But not too long ago, and perhaps even now, many of India's well-known athletes lived in abject poverty, forgotten by the nation, once their sports careers were over.